1335MABINI: Zn Gallery is pleased to present “el intruso/ e n t r e m e t i d o”, a group exhibition curated by Guillermo Paneque featuring works by Poklong Anading, Roberto Bellini, Anna Katrina Beltran, Roberto Chabet, Maria Cruz, David Griggs, Nilo Ilarde, Robert Langenegger, Manuel Ocampo, Jayson Oliveria, Maria Taniguchi and MM Yu, a film by Jorgen Leth, speakers and caps collected by Romeo Lee, and a selection of found objects and rumours. Maybe only our own skin, and even so, are we sure that it is ours? The title of the exhibition is based on a disturbing image from L´intrus, a story by Jean-Luc Nancy – an account of his experience of having had a heart transplant. He offers the experience as a lens through which to view the question of identity. How have we thought the body? He describes this experience of his body as the experience of having imposed on him, in an inescapable, incisive way, a practice of questioning identity and the need for a new understanding of the body. “Life”, writes the filmmaker Jorgen Leth, another inspiration for this exhibition, “...has to be carefully scrutinized and examined. Good and Evil is an inquisitive film.... What's the inner meaning that lies behind what people are doing, talking about, and feeling? Good and Evil attempts to answer this question. [It] is a film that distinguishes between good and evil, between beauty and ugliness, between the body and facial expressions, between instinctive feeling and reason, between the spoken word and the gesture, between a tender touch and a simple cup of coffee...There must be some system to our madness”. “El intruso/ e n t r e m e t i d o” features works that represent a broad range of practices, including film, site-specific installation, painting, photography and sculpture, many of whom use non-traditional materials in an unexpected manner. All these artworks have been “choreographed” together with a collection of objects and “rumours” from disparate origins, also speaking about our relations with objects and our fascination with them (Romeo Lee´s being a good example), to establish affinities and correspondences between different cultural, historical and disciplinary spaces and temporalities. 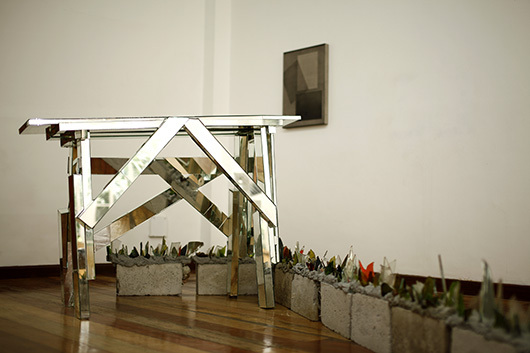 Most of the artworks have been shown before, but as Paneque says: “What was attractive to me was to let them speak again in a different context and see what happened…My approach wasn´t master-planned and subject centered; instead it appeared to grow organically out of a dialogic and associative process of research, more related to the workings of a picaresque novel where one event leads to another through accidents, unexpected detours and oblique associations. In each room there is the sketch of a possible scene that cannot be summed up in simple words but which invite the viewer to experience it and engage in a new dialogue”. “El intruso” is an ongoing project conceived by the artist Guillermo Paneque. It could be described as a “Chinese whispering novel” with new chapters exhibited in different cities. The first installment was at Michel Soskine gallery in Madrid, 2012. Many thanks to: Ringo Bunoan, Valeria Cavestany, Maria Closa, Lena Cobangbang, Romeo Lee, Manuel Ocampo, Danish Film Institute and Silverlens Galleries.